In the world of Bridge Cranes and Electric Hoists the configurations are highly customizable. The need for customization arises from the various conditions dictated by application and environment. Suppose your warehouse may be a refrigerated storage space and your machines must operate at freezing temperatures or your warehouse has low ceilings and your head room is limited, there are options that can help you maneuver around these obstacles. One of the most custom option intensive industries is the Oil & Gas industry. The environment that most Oil & Gas applications are dealing with can be extremely dangerous and it is critical that the proper equipment be sourced for such operations. "It is important that the individuals responsible for specifying and purchasing material handling equipment for use in these environments can properly identify any hazardous locations or areas per the U.S. National Electric Code (NFPA 70), IEC Standard 60079, and other applicable local, national and international standards to ensure compliance with these regulations and safe operation," (Joe Runyon, Columbus McKinnon)." In most off-shore operations there is a much higher potential for flammable gases and chemicals to be present. The presence of these hazardous materials means all off-shore applications are highly regulated and call for stringent guidelines to be followed to ensure the safety of the employees and the operation and to help prevent avoidable disasters from happening. In some cases, the application may be a temporary installment or a process that is executed extremely infrequently and the budget for the project may not justify spending extra on completely stainless steel components, such as chain. Chester offers, nickel-diffused chains or copper-plated hooks for projects with, “…headroom constraints or to reduce costs for equipment that will be used infrequently or in temporary applications. In these cases, Chester also can provide plated components to reduce costs. For equipment that is relied on heavily and is required to maintain spark and corrosion-resistant qualities for the life of the equipment, we actively promote the lasting protection of solid spark and corrosion-resistant materials rather than plated components.” (Joe Runyon, Columbus McKinnon). The use of solid spark and corrosion resistant components including stainless steel load chain, wire rope, and hook latches; and solid bronze hooks, hook locks, and trolley wheels, with aluminum or stainless steel hand chains. The use of plated chains, hooks, and wheels for temporary protection against sparking and corrosion. The use of Explosion proof NEMA 7 control pendants. (However, by utilizing intrinsically safe controls, Chester Hoist is able to provide NEMA 4 control pendants and limit switches which are not only weather resistant, but are also lighter and more compact than NEMA 7 pendants and limit switches. 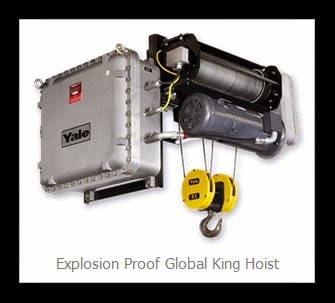 If you are looking for a hoist for your Off-Shore/Hazardous application you may want to consider the Explosion Proof Cable King or Global King hoists. For more information about Explosion Proof and Spark Resistant products, check out this great article written by Joe Runyon, Vertical Marketing Specialist for Oil & Gas at Columbus McKinnon. 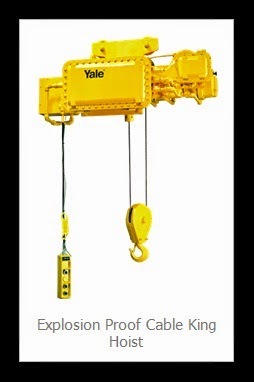 Check out our selection of explosion proof and spark resistant hoists and parts online or call us at 800-733-2231 to find out more about the various spark resistant and explosion proof options we can source for your next off-shore job!